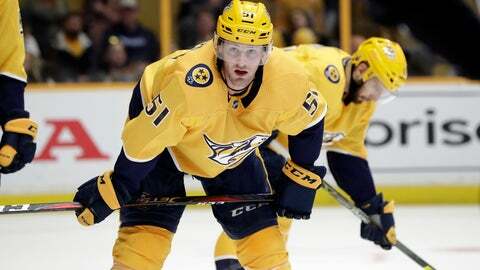 NEW YORK (AP) — The NHL is criticizing an arbitrator’s decision to reduce the suspension of Nashville Predators forward Austin Watson, who pleaded no contest in July to a domestic assault charge. The NHLPA also released a statement Friday, saying: “The NHLPA takes domestic violence seriously and continues to work together with the NHL to ensure that players are educated on this important societal issue. “As part of those efforts, the NHL/NHLPA conduct domestic violence awareness training at our Rookie Orientation Program and during the season for all NHL players.